On 31 December 2016, President Tsai Ing-wen told journalists at a year-end news conference [31 December 2016] that China has resorted to military and economic threats to intimidate Taiwan. Tensions between Taiwan and China had already begun to intensify when American president-elect Donald Trump and Ms Tsai spoke on the phone, in doing so breaking longstanding diplomatic practice and the US’s “One China” policy. Ms Tsai referred to China upping its military activities near Taiwan, while Beijing also announced that São Tomé and Príncipe, one of Taiwan’s remaining diplomatic allies, had switched its allegiance to mainland China. The Chinese Ministry of Foreign Affairs had called on the United States to prevent Ms Tsai from entering the US, claiming that such a visit – even if just in transit – would embolden independence activists in Taiwan. 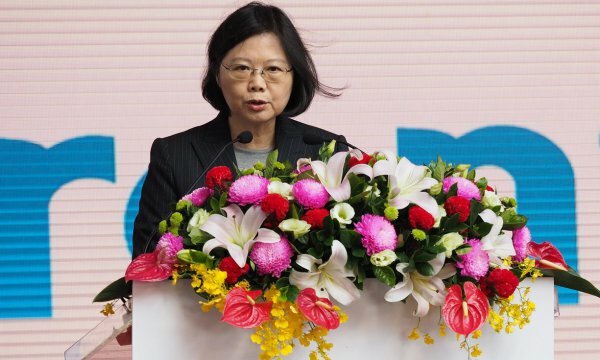 President Tsai Ing-wen of Taiwan sharply criticized China’s leaders on Saturday [31 December 2016], saying they had resorted to military and economic threats in order to intimidate the island. Tensions between Taiwan and China, which have been rivals since the Communist Revolution of 1949, intensified in December  after Ms. Tsai spoke on the phone with the American president-elect, Donald J. Trump, breaking a longstanding diplomatic practice. In recent weeks, China has stepped up military activities near Taiwan, sending its sole aircraft carrier through the waters near the island and dispatching military planes in the region. On Monday [2 January 2017], Beijing announced that São Tomé and Príncipe, an island nation off the west coast of Africa that was one of Taiwan’s fewer than two dozen remaining diplomatic allies, had switched its allegiance to the mainland, provoking an outcry in Taiwan. Ms. Tsai also sought to quell concerns about planned stopovers in Houston and San Francisco during a visit to Central America scheduled for January . The Chinese Ministry of Foreign Affairs on Thursday [29 December 2016] called on the United States to block Ms. Tsai from entering the country, warning that such a visit would embolden independence activists in Taiwan.